Confirmed - Google Voice works in India ! Yes, I just made phone calls to USA using Google Voice and it worked very well (so well, that I was floored by the quality). Probably, I am one of the random lucky user for whom the Google Voice got enabled. Let me tell who how I did it. I was actually not too surprised as just couple of days back there was a talk on Twitter that Google Voice activated messages are coming up for users in India. However, none of these users were actually able to use Google Voice. But to my utter surprise, I was able to make phone calls in US and talk without any hassles. Once you click on “try it now”, a small window opens up like the one shown below. 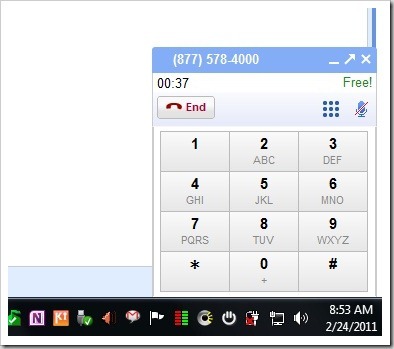 However, before make a phone call you will be required to download a Voice plugin. Once voice plugin was installed, I just dialled the number (Did not want to bother any of my friends at night, so I called up my hosting service based in USA ). The voice call went through like a charm, and the call quality was absolutely phenomenal (even better than normal phone calls). The screenshot below is a proof that call went through ( 37 seconds into the call) and their is a time stamp, so no question of ambiguity in the date as well as to when I made the call ! 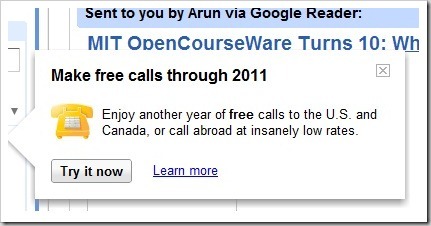 Is Google Voice officially getting activated in India? I think not – this may be just testing going on at Google’s end, but what about legalities of making VOIP phone calls in India ? Has google taken formal authorization to start these services in India ? There are no answers to these questions right. We will keep you posted on this as soon as we get some confirmation. 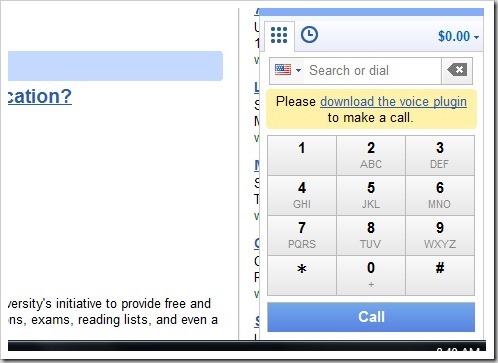 Till then if you are one of the lucky ones who have got Google Voice enabled, enjoy full year of making free calls to USA…that’s huge, ain’t it ! it doesn’t work any more though I also made a couple of calls some months back. yup it went for a toss now..
Not working now….. is there any voip offer low price calls in India? That’s great! Will try it soon. Google voice started working from last couple of days. excellent call quality. does it work now, googlevoice in india. this service is not available for indian users. YOU MAY NEED TO ADD CREDIT BUYING 10$ RECHARGE SO THAT U CAN CALL , I USE IT TO CALL INDIA , WE CAN USE SAME WAY. I have been been using google voice in the United States for more than a year now, and it works like a charm. I made an account from here, for my dad who lives in India, and he’s using it too. In your case, you might have been lucky, but the workaround is to create a google voice account from a United States IP. Ask a friend, use a proxy. See what happens! It works. You need to install VPN which assigns you the US IP. google voice allotes a unique no. to the user if that no. is from US then you can make calls free whithin US and few other countries. but whenever i tried with it says same you do not have enough credit to make call. That's great! Will try it soon. it doesn't work any more though I also made a couple of calls some months back. yeah me too tried few weeks back, suddenly Google voice gadget appeared in my gmail window. I was even able to call my mobile. But then when I tried again for another call it said ‘Insufficient balance’. After sometime I was not even able to get the Google Voice gadget in my mail. It disappeared thereafter. If credits are added by users whove recvd call feature in gmail chat, then will a google number with other google voice features be alloted or will the features get activated only till ‘official’ enabling of google voice in India? But the real big thing is to use google voice’s one number in india. As per “friends” in Google (mountain view) it is a bug or an issue in testing. But seems like they are planning to release a “promo” rather than complete “feature” when they start. Yes its worked for me also.. Same happened with me – but I didnt close that tab f chrome since last 5 hours. and i still have access to Google voice. I think this was enabled as a part of some testing. ;)better hibernate my machine . Yes, it does work wonderfully if you have a good speed on your Internet. I am in the US and have been making free calls within US. However, I cannot call India unless I top up my balance, which is a nominal $10. This could take over skype. More so, I am able to send free SMSs to mobile carriers in the US, and they can actually SMS you back. It makes for another great GOOGLE conversation. Thanks for letting us know about SMS thing…was not aware that Google Voice also offered that.. I would encourage you to try ‘Google Labs’ feature. It is loaded with quite a few applications which make Gmail worth the while. Yeah..it worked for me too ..i got this new icon my gmail talk . It is my understanding that ‘conferencing’ local land line call with international VoIP call (thus bypassing ISD toll) is not allowed. Yes. I am one of the lucky person today to test a call to US. It’s simply superb. Yup…it worked for me too from @ 10 days back…even charged it so I can call outside US…call quality is good! I got the same pop up few days back, but when i tried to make a call it said insufficient amount (There was some message related to credits, which actually meant i need to pay). Now I don’t see google voice caller in my google account.